An artificial glass, with an interesting iridescent effect. 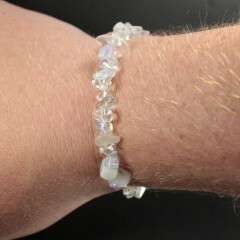 It is sometimes mis-sold as Opal or Moonstone, but it is not – it is a man made glass. There is very little actual information online regarding this glass, from reputable sources at least. This page contains the information I could find, with my own assumptions. This glass is purely used as a decorative object, as far as I can tell. It is sold tumbled or carved, or cut and polished into other forms such as cabochons or beads. Due to its low price it is popular in costume jewellery. The name is a little unusual. It primarily refers to this glass, but has in the past been used to refer to low grade impure Opal. It has also been used to refer to “Tiffany Stone”. To confuse matters more, there is a very similar looking type of glass referred to as Opaline Glass. According to the Oxford Dictionary it was first used in the late 19th century, by the American geologist Albert H. Chester. Unfortunately I don’t have a copy of the book to check if it has any information on manufacture. Somewhat confusing, to say the least… on this website we will only ever refer to this glass as ‘Opalite’. This glass is sold under many names, most of which refer to other materials; not glass. Argenon, Milk Glass, Moonstone, Opal, Opaline, Opal Moonstone, Opalised Fluorite, Opalised Glass, Opalized Glass, Rainbow Moonstone, Sea Opal, Tiffany Stone. As a man-made glass, there are no locales for this. It is primarily manufactured in Asia, China especially. So… what is Opalite, anyway? Frankly, it is quite hard to find any information on the manufacturing techniques used to make this glass. There are many references to supposed manufacturing practices, but how accurate they are, we simply can’t say. Some websites suggest the stone is a ‘glass resin’ mixed with metal film or powder, which creates the iridescent effect. Others suggest that this is cast glass with Fluorite dust mixed in. Others say they may be cast glass with silica fragments scattered in the mix. Some say Dolomite is used. Some even say these pieces are ‘laser treated’ Quartz! Evidently, there are no clear answers, and some people are likely to be spinning fiction about this glass for sales. Short of finding and visiting a manufacturer, this may be as good as we get. Personally, I think the glass is cast with some diffusing or refracting particles or powders in the mix. I am not a materials engineer, however! There are a few similar glasses which have been used in recent times for art and decorative glass pieces – Sabino glass, and Fry glass being two that are very similar to Opalite. This page contains some information about different types of Opalescent glass, and a ‘recipe’ – currently, that’s as close as I’ve gotten. 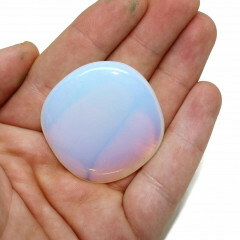 One day, finances willing, I’d like to have some Opalite examined in a lab, and maybe cast some light on this mystery. There are a few fairly simple tests that can be done to test a piece. One easy test is to check whether the ‘stone’ has bubbles in it. Not every piece will, of course – but it is a clear indicator of glass. This glass also shows something called the Tyndall Effect, which is a type of light scattering – essentially, the glass appears to be a blue-white colour, but when light shines through it, the light will be orange. Opalite typically has a white streak, so make sure to use black streak test plates. As a glass, this should be pretty safe. The most dangerous thing, frankly, would be either the dust from cutting and polishing it, or the sharp edges if it was broken. As a man made glass, some people believe this material does not hold any metaphysical powers at all. In our opinion, it’s best to look at or hold the stone and see if you feel anything. As above, not everyone believes in the healing powers of any form of glass – whether this, or Goldstone, or any of the others. However, some people believe that this glass can be used to help with depression and tiredness, and that it may help to stabilise your emotions. It also may help with frayed nerves, stress, and anxiety by calming you down. 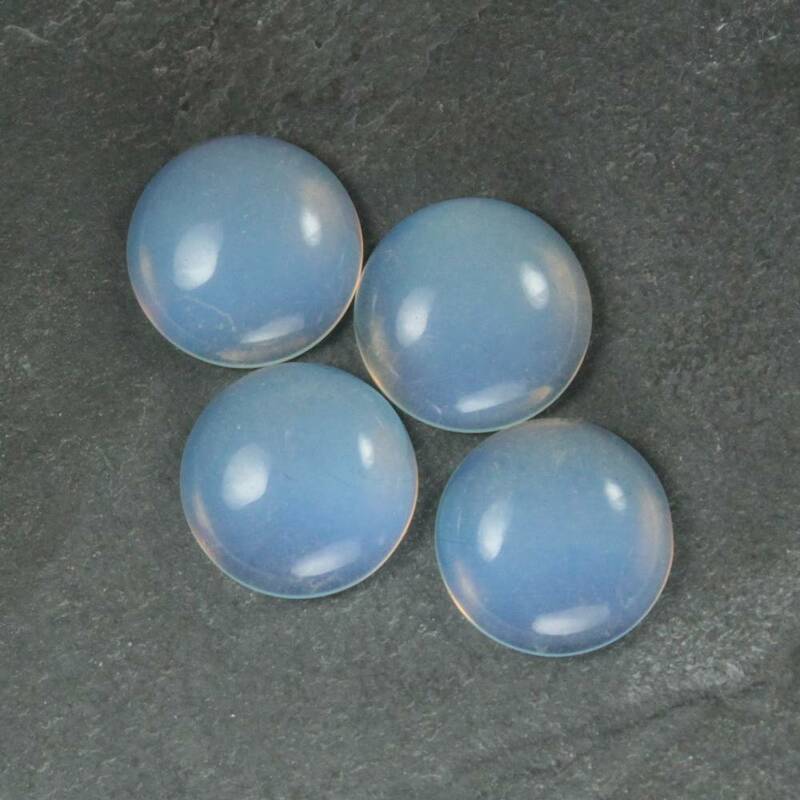 As mentioned in the information above, we do not entirely know the process used to create Opalite or what it may contain. As a glass, it ought to be relatively inert, but it’s better to err on the side of caution. This glass is typically used to open up the third eye chakra, and bring visions, insight, and intuition. It may also be used with the crown chakra to stimulate visions. Some people associate this glass with the Zodiac sign ‘Cancer’ – for the 21st June to 20th July.